The Eriez Metal Loss Monitor (MLM), part of Eriez’ SMART (System Monitoring and Reporting Technology) product line, is a powerful solution that enables operators to determine the relative quantity of valuable metals that are passing through their scrap yard unrecovered. The monitor continually scans the residue stream for metal that has escaped the process and is headed for landfill disposal. The Eriez Metal Loss Monitor takes the guesswork out of metal recovery, giving users the ability to observe the performance of their system to spot variations over time. With the MLM in place, maintenance issues and adjustment requirements are quickly located. The data gathered also offers beneficial insight needed to properly evaluate whether additional or different separators should be incorporated to reduce metal losses to improve profitability. 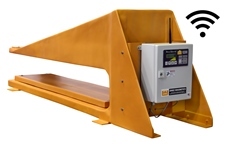 The Eriez Metal Loss Monitor can be positioned upstream to provide hand-picking assistance. Alternatively, it can be placed downstream of pickers before the bunker. Downstream positioning gives supervisors the ability to track picker performance, provide incentives and accurately assess how many pickers are necessary. Metal that passes through the monitor produces an alarm signal (horn/beacon) and the event is recorded in a data file. For more information on Eriez’ Metal Loss Monitor, visit http://en-us.eriez.com/products/metallossmonitor/.